This is a type of pastry made from many layers, which when cooked rises to give a light, flaky texture. Savoury dishes using puff pastry range from pie toppings to vol-au-vents. 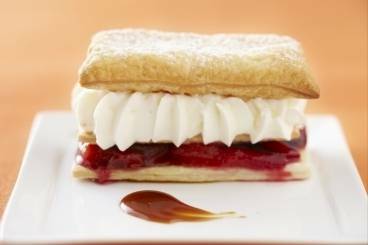 Layers of puff pastry, vanilla cream and poached plums served with a salted butter caramel sauce. Sesame mille-feuille with smoked halibut, vegetables marinated in cream, white balsamic vinegar, dill and lime zest served with a beetroot drizzle. 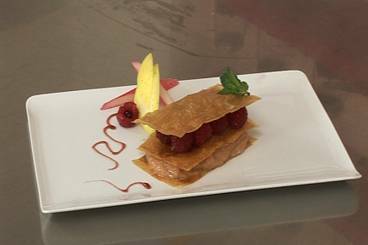 An attractive mille-feuille of rhubarb and apple compote with fresh raspberries. 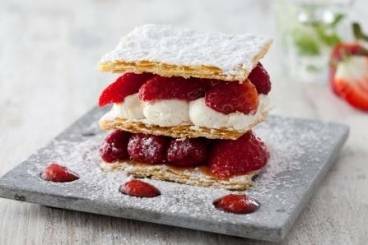 Stacked layers of puff pastry with poached strawberries and raspberries with a vanilla Chantilly cream. Finished with a drizzle of Strawberry mojito. Layers of puff pastry filled with chestnut cream and served with a salted butter caramel sauce. A mini version of a classic French dessert - puff pastry layered with vanilla cream and served with a salted butter caramel sauce. A three tiered tea time treat with spiced plums and creme chantilly. An easy and impressive light lunch or starter - a mille-feuille of tiger prawns cooked with fresh herbs and served with rocket leaves. 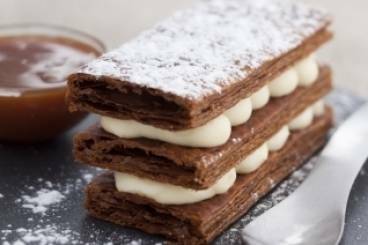 Work with layers of filo pastry to create your mille feuille and make a pastry cream for it flavoured with rum and vanilla, then top with caramelised bananas! Layers of puff pastry, vegetables, salt baked mackerel and balsamic glaze.